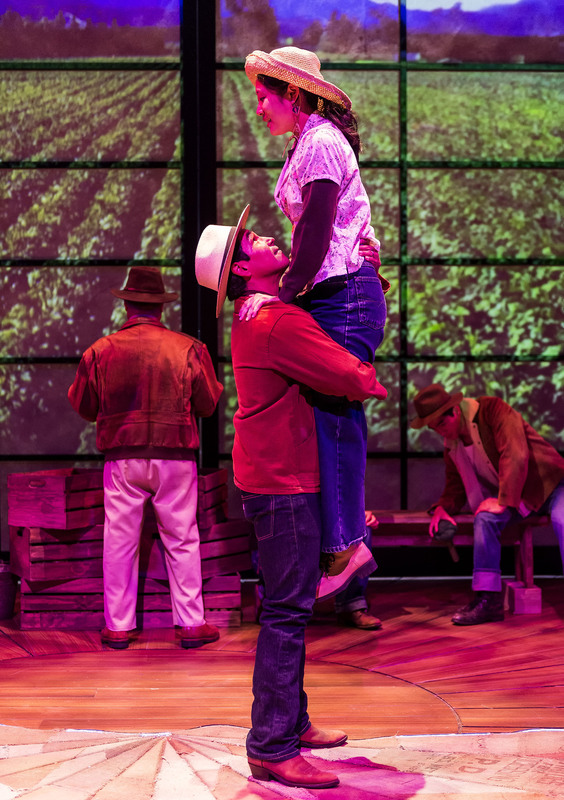 The latest Luis Valdez play, Valley of the Heart, which ran at the Center Theatre Group’s Mark Taper Forum in Los Angeles, CA, last fall, is a love story between an Asian American woman and a Mexican American man—characters rarely portrayed on the American stage. While watching, I thought of my own Chicano family: my sister married a Japanese/Mexican man from New Mexico, my son married a Filipino, and we think of our grandchildren with loving affection as “Mexipinos.” This could have been about them. Valdez’s play explores miscegenation, identity, and how Latinx and Asian people fit into the fabric of American society. 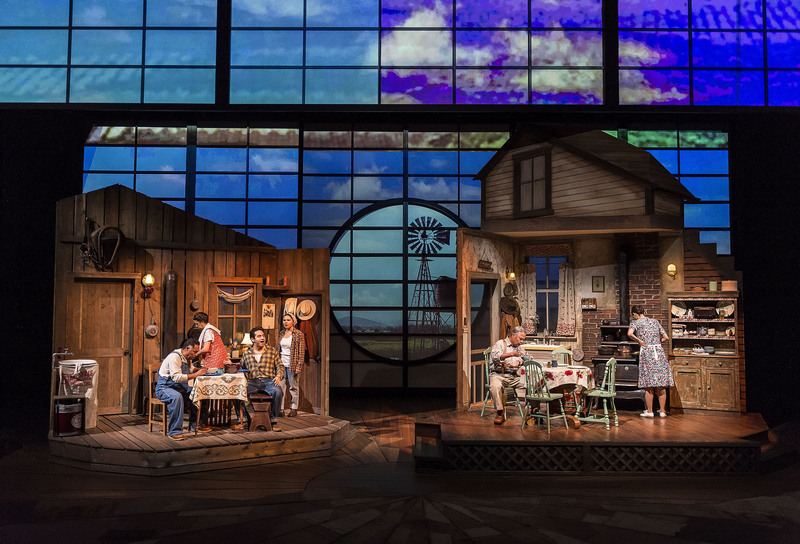 Set in the 1940s in the small farming community of Cupertino, California, two families live side by side. Thelma Yamaguchi is the daughter of Hana and Ichiro, Japanese immigrants who grow vegetables on their ranch. Next door lives Benjamin Montaño and his Mexican family who work for the Yamaguchis. Benjamin and Thelma fall in love even though she has been promised to a Japanese man. But when the Empire of Japan invades Pearl Harbor, the Yamaguchis are sent to a concentration camp and Thelma announces she is pregnant with Benjamin’s child. That is when loyalties to clan and country are severely tested. 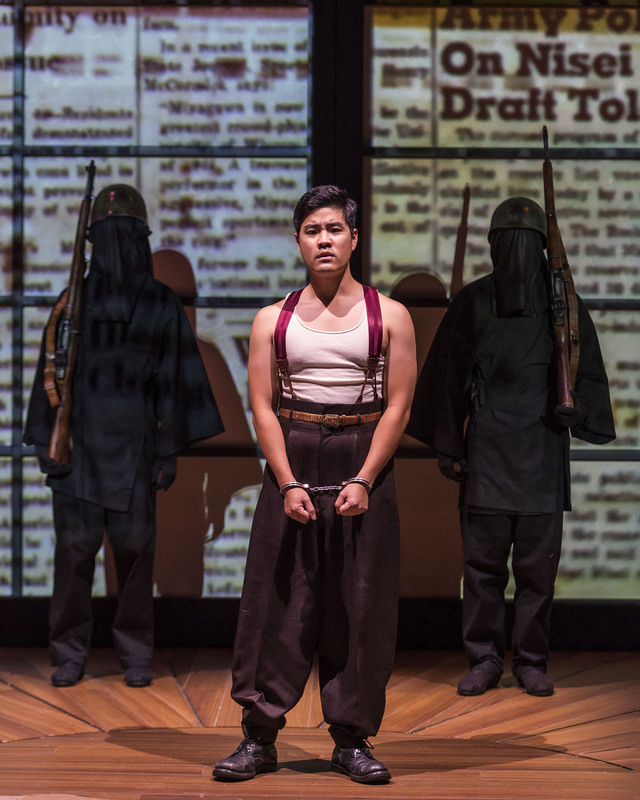 Scott Keiji Takeda in the Center Theatre Group production of Luis Valdez’s Valley of the Heart. Photo by Craig Schwartz. During that time, the Japanese were reluctant to marry outside their race, and American laws on miscegenation were so extreme that Mexicans, considered white thanks to their Spanish blood, could not marry Asians, because they were not white. This reality was depicted in the play: in order for Benjamin to marry Thelma, he lies to the clerk by claiming to be Yaqui Indian. After the Japanese attacked Pearl Harbor, President Franklin D. Roosevelt signed Executive Order 9066, which interred more than 120,000 Japanese Americans in concentration camps. During the summer of 1943, Mexicans, especially Pachucos, were attacked and beaten by military personnel in Los Angeles because they wore zoot suits and were suspected of being anti-American. Both immigrants groups adapted to the situation by proving their loyalty to the United States: Issei—Japanese immigrants to North America—and their children—Nisei—fought valiantly on the American side, as did Mexican Americans. After the war, both groups returned home and faced immense racism, but they soldiered on, integrating into American society; Mexican Americans even started civil rights organizations, like the veteran’s outreach program American GI Forum. The cast in the Center Theatre Group production of Luis Valdez’s Valley of the Heart. Photo by Craig Schwartz. In Valley of the Heart, Valdez, whose parents immigrated to the United States from Mexico, paints a portrait of America in the forties that is seldom seen or discussed. In Valley of the Heart, Valdez, whose parents immigrated to the United States from Mexico, paints a portrait of America in the forties that is seldom seen or discussed. Very few plays cover the Asian Latino experience of the time, when Cupertino—now known as Silicon Valley—was just a farming community. And while this isn’t Valdez’s first play with an Asian character—I Don’t Have To Show You No Badges features a Japanese American dancer named Anita in a supporting role—Valley of the Heart is significant because an Asian character takes center stage. In the play’s program notes, Valdez, who was born in California, explains that his Mexican father worked for a Japanese American farmer just before World War II and the “farmer and his family were forcibly relocated” to an internment camp while Valdez’s family was encouraged by the Farm Security Administration “to tend the farm in the Japanese American owner’s absence.” When the war ended, they lost the farm. Later, “another family of migrant farm workers moved down the street” and Valdez become friends with a boy named Esteban, whose mother was Japanese and father was Mexican American. This couple became the source material for the play. Lakin Valdez and Melanie Arii Mah in the Center Theatre Group production of Luis Valdez’s Valley of the Heart. Photo by Craig Schwartz. I’ve been teaching Latinx theatre all my life, and three years ago I starting teaching Asian American theatre and film. I have a multi-ethnic mix of Latino (Native and foreign-born), white, and Asian American students, as well as Chinese exchange students. A common theme in Asian and Latino theatre that always comes up in our discussions is identity and not being completely accepted into the fabric of American society. Haoles [whites] took my land, haoles imprison my people, smashed our hopes and dreams but this I cannot allow this. They will never destroy our lineage, our seed, blood lines. Our Japanese heritage must remain pure, undefiled. Go away… KUTABARE [Drop dead] GO AWAAAAY! 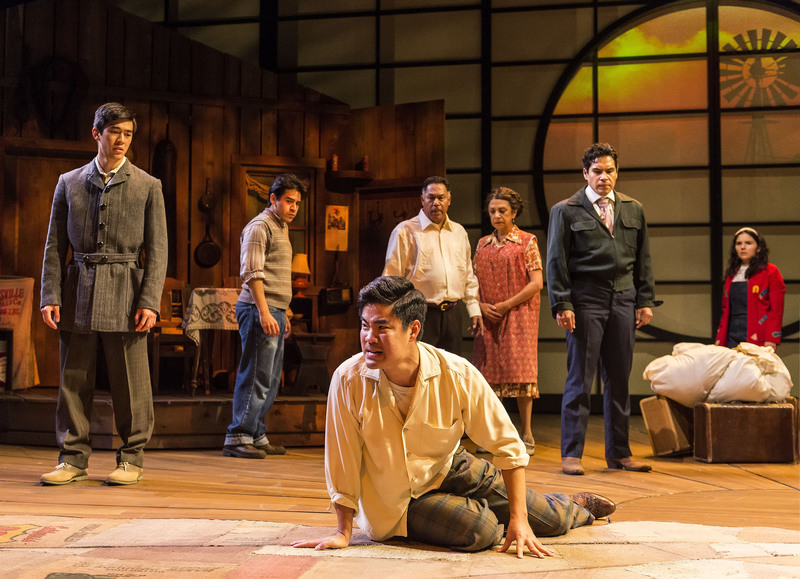 L-R: Justin Chien, Moises Castro, Scott Keiji Takeda, Daniel Valdez, Rose Portillo, Lakin Valdez and Christy Sandoval in the Center Theatre Group production of Luis Valdez’s Valley of the Heart. Photo by Craig Schwartz. Much of the playwright’s work deals with mestizaje (mixture), or what the Mexican philosopher José Vasconcelos termed la raza cosmica (the cosmic race): the New World man whose colors are composed of all the races. I hope Dad remembers he has four great grandchildren. And what a mix. Our family’s heritage is Mexican, Japanese, Scotch Irish, Croatian, French, and African American. We’re Catholic, Protestant, Jewish, Muslim, Buddhist, and atheist. I once proudly said to my wife, Azalea, who is Mexican: “Our sons have a Jewish half-brother, a Japanese cousin, and an Arabian aunt!” I am part Cuban, and when I did my DNA at 23andme it listed 64 percent European and 32 percent East Asian and Native American. In the 1940s, during the time of Valdez’s play, mixed race people were looked down upon, but today being mixed is celebrated. We Americans are part of la raza cosmica, something that is becoming more common, and more accepted, in our country.